It's still hard to believe that Dio died over a year ago and his passing was made more emotional because he was singing as good as he ever had been in his life, and Heaven & Hell was far more exciting than any form of Black Sabbath reunion with Ozzy Osbourne, whose voice, it must be admitted, is sounding very shaky these days. 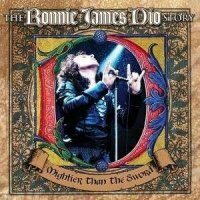 To celebrate Dio's music – which all true rock/metal fans are familiar with anyway – this two disc CD set has been released. It accurately covers the many different phases of his magnificent career. ‘Mightier Than The Sword’ does not discriminate and focus solely on Dio’s solo career or his work in Black Sabbath. Instead, there’s a good mix of stuff and beginning proceedings is ‘Carolina County Ball’ by Elf and ‘Love Is All’ from Roger Glover & Friends. Both are good, strong tracks but a world away from Sabbath. Much of disc one is taken up with Rainbow, a seminal hard rock band if ever there was one. Some of Dio’s most memorable and cherished songs were crafted during his tenure with Ritchie Blackmore. Collections like these are often controversial amongst fans because of the choice of tracks but ‘Mightier Than The Sword’ is a nifty selection that finely represents the career of one of rock and metal’s strongest and most profound singers. All hail!